I have loved crêpes for many years. We never ate them much as a kid, but in college, my parents gave me this crepe maker, and I really enjoyed making them. This griddle is also perfect for making pancakes and tortillas. Anyway, my favorite way to eat them has always been with Nutella, but this most recent savory version is pretty terrific. And a very easy dinner. It is savory and light, but quite filling. 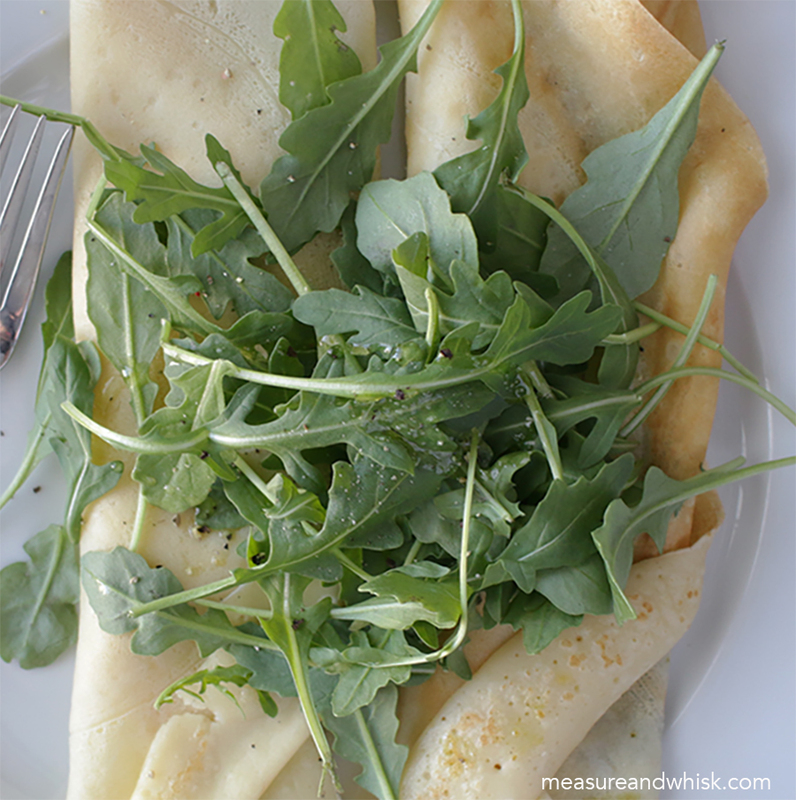 It feels a little springy for this time of year, but arugula is in season in the fall, so it is totally seasonal, even if it feels like a spring dish. If you make it and post a photo on social media, I would love to see it! 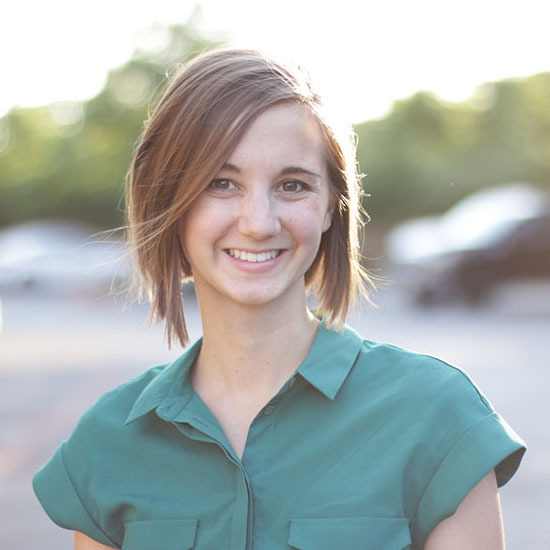 Just tag @measureandwhisk in the photo, or use the hashtag #measureandwhisk so I can check it out! In a large bowl, combine the flour, sugar and salt. Create a well in the center. In a liquid measuring cup, or another bowl, combine the eggs, milk and water. Mix them well. Pour the liquid mixture over the dry mixture, and very, very slowly, begin stirring with a fork. The key is to end up with a batter that has almost no lumps in it. I mixed mine for about 10 minutes, very slowly incorporating the flour into the liquid. Once the flour is totally incorporated, cover and refrigerate for 20 minutes. Cook in a frying pan, by pouring about 1/3 cup of batter into the hot pan and tilting it in all directions until the batter coats the bottom in an even layer. Let it cook for a minute or so, then carefully flip the crêpe and cook for another 45 seconds or so on the other side. Top with the following toppings and serve immediately. You can also cook them on a crêpe griddle like the one I have, just pour the batter out onto a hot griddle, spin the dowel to spread the batter over the surface and let cook for a minute. Flip, then let cook for another 30-45 seconds. Remove and serve with toppings below. 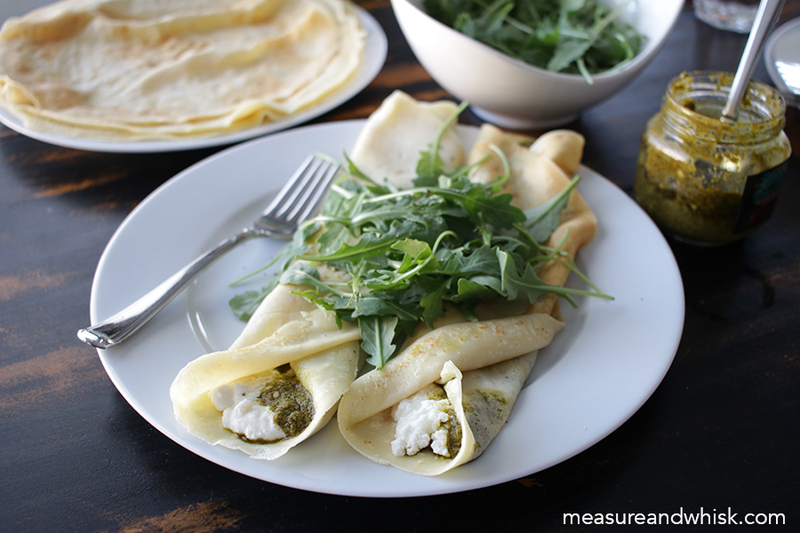 Once your crepes are done, spread some ricotta on each one, top that with a few teaspoons of pesto. 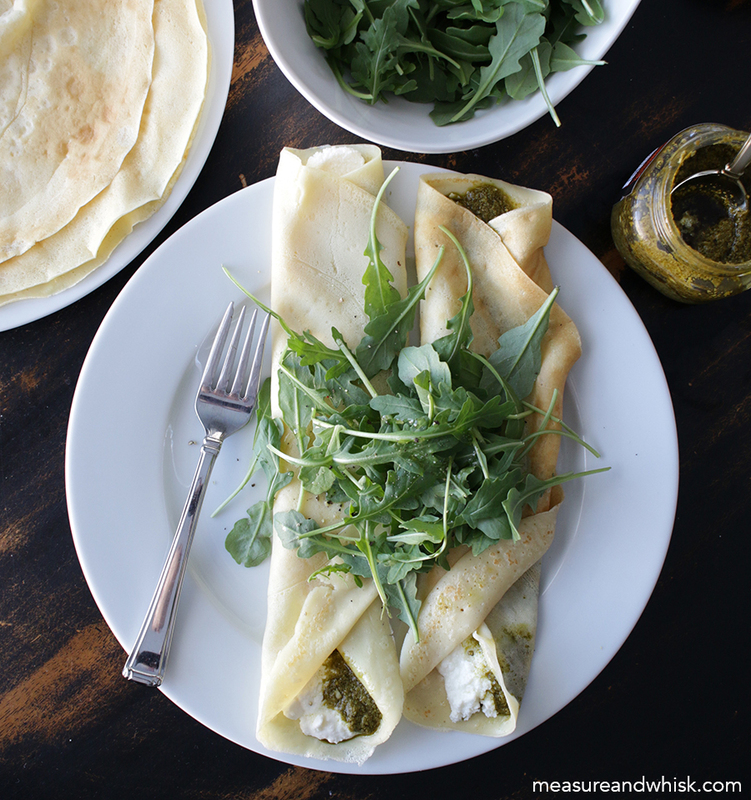 Roll up your crepe, and top with arugula. Sprinkle with a few drops lemon juice, olive oil, and a quick shake of salt and pepper. Enjoy! This looks really good ! I love pesto but I never thought of using it on crèpes (I just love ham and cheese crèpes too much haha), will definitly try it next time. Ham and Cheese are some of my favorites, so I totally get where you are coming from :) Also, thanks for letting me know about the book links! (I think) I have fixed them!